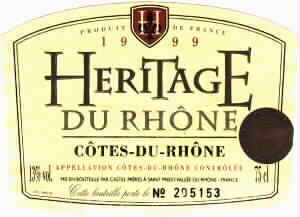 It is probably a marketing ploy rather than anything else but a number of bottlers of wine from the Rhone valley sell their wine in numbered bottles under a "heritage" mark. Ploy or not, in this case, the wine in the bottle is good indeed. Usually, for the obvious reasons, I tend to sample different vintages of the same wine in chronological order. That was not the case in this instance. I bought a bottle of the 2000 vintage in France and really enjoyed it so, when I saw the 1999 on sale in Hertie in Germany, I bought a bottle and we drank it at the first opportunity. It has a lovely aroma and a delightful texture and fruity taste. The balance of acidity is just right. The only thing that causes me to mark it slightly lower than the 2000 is that the after taste is not so good. I do not know if that is to do with the age of the wine, the condition under which it has been kept or just the variation from one year to another. If you have the choice, go for the 2000 but if you are near to a Hertie in Germany and want to spend about ten DeM on a bottle of red wine then this is a fine choice. Of course, if you have the choice, buy it in France for not much more than half the price.